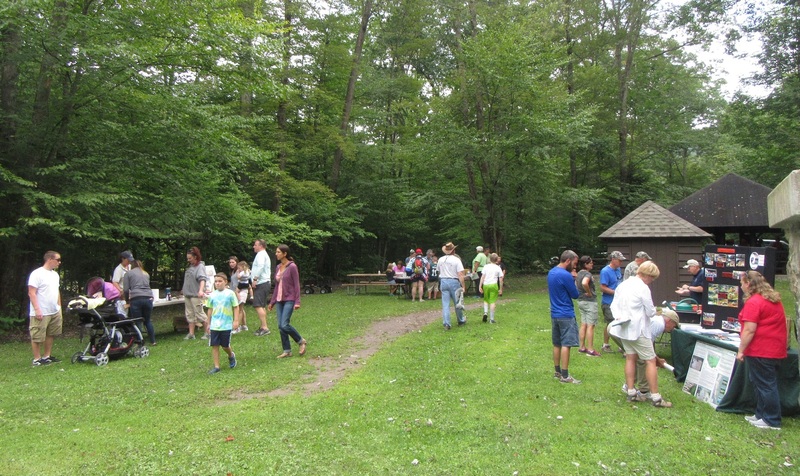 Families (top) move from one educational station to another at Worlds End State Park on Aug. 25, as their children participate in hands-on activities during the Loyal to the Sock event coordinated by the Middle Susquehanna River Keepers Association. The Loyalsock Creek won the 2018 River of the Year contest via online voting conducted last November and December. Middle Susquehanna Riverkeepers Association director Carol Perenzen (above, left) greets guests from New Jersey, including (continuing from left) Jeremy Cooke; Max Davadilla; Ryan, Jason, Jacob and Natalie Cooke, all visiting Worlds End State Park for the first time. The ongoing celebration of the Loyalsock Creek as the 2018 River of the Year (ROY) in Pennsylvania moved well upstream on Saturday from its confluence with the West Branch Susquehanna River. Representatives of designated ROY sponsor, the Middle Susquehanna Riverkeeper Association (MSRA), were joined at Worlds End State Park in Sullivan County by numerous environmentalists and groups and individuals who engage nature from a variety of perspectives. 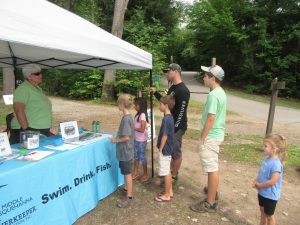 The family-friendly event drew hundreds of locals who are “Loyal to the Sock,” as well as visitors from miles away who wanted to know what is so special about the waterway. Revered for its natural beauty, trout fishing, spring kayaking, and a healthy home for the Hellbender – the largest native amphibian and the stream’s official mascot, the 64-mile long Loyalsock Creek makes a rapid plunge from the mountaintops of Sullivan and Wyoming counties through Lycoming County to the river. Recent flash flooding along the Loyalsock reminded its fans of the power of nature and of the scurge of erosion. Coincidentally, a primary goal of the River of the Year program, which is sponsored by the state’s DCNR, the Environmental Council, and the PA Organization for Watersheds and Rivers (POWR), is to address the issue of erosion and leverage funds for creek bank stabilization and habitat restoration. 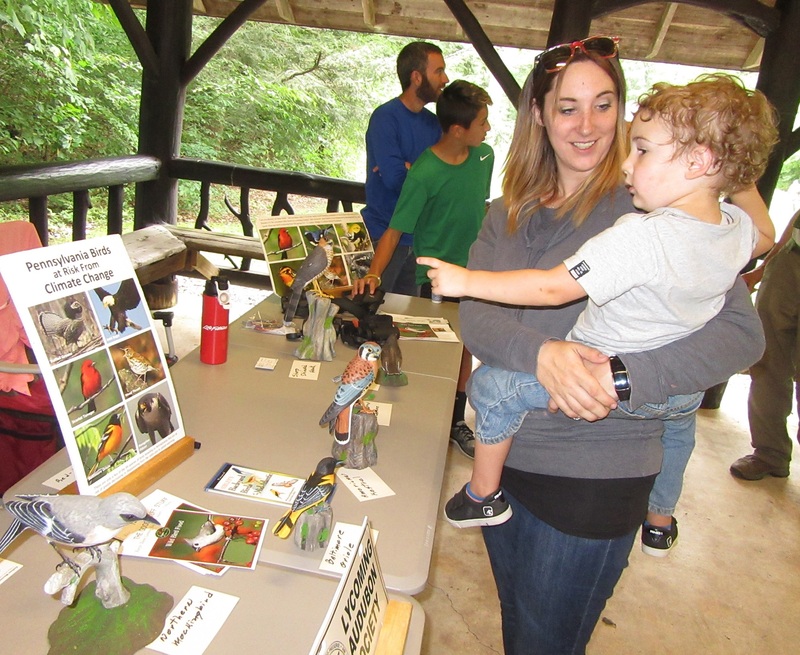 Several exhibits and activities, especially those geared to children, specifically addressed the precarious health of mountain streams in the face of development and other changes wrought by human interaction. Elizabeth Capaldi of Bucknell University explained why the disappearance of eels from the stream has been detrimental to the population of mussels, among the best natural filters of the waterway. Four representatives from the Sullivan County Conservation District provided an easy-to-understand demonstration of the importance of vegetation to both staving erosion and filtering the water. “This is the first time we’ve been here, but we’ll be back. 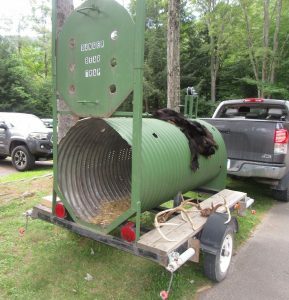 He loves it,” Kevin Arbogast of Williamsport said of his son Lucas’s interest in the children’s activities. 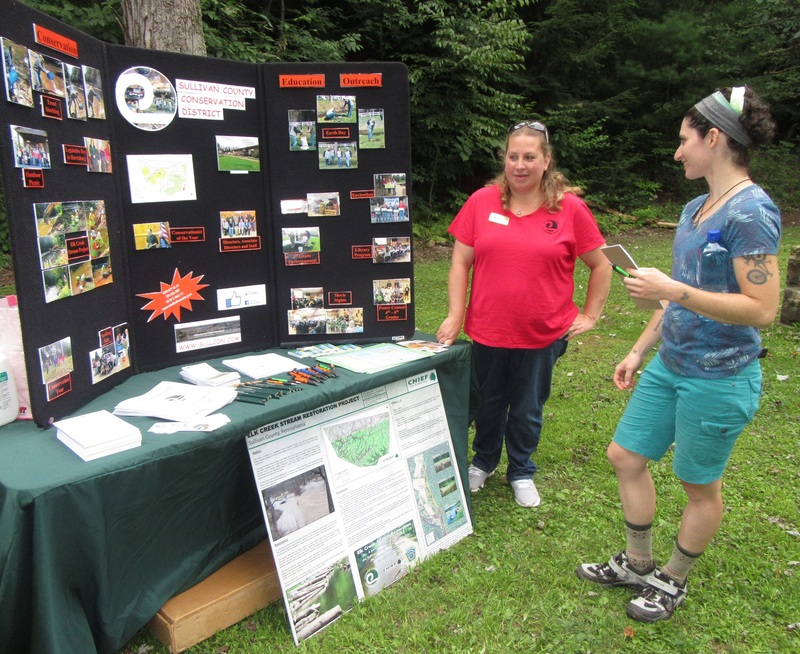 After conversing with Carrie Richmond (above, left) of the Sullivan County Conservation District, Kelsi Randall (right) of Milmont was emboldened in her belief that ATV use along streams is adding to erosion issues. “I’ve argued about this with my boyfriend and his friends,” she related. Pack 14 Scouts from the Newberry section of Williamsport fashioned musical instruments from found natural items with DCNR educator Jane Swift, and painted landscapes with naturalist Wanda Plowman. A bear trap (below) brought to the event by the PA Game Commission garnered quite a bit of attention, as did their collection of pelts. “We’re always looking for new places to go and new things to do,” said Marci Cooke of Egg Harbor Township, NJ, whose family had just arrived at the park and were getting a briefing from Parenzen at the MSRA tent. 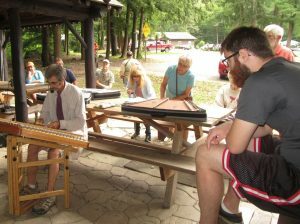 The full day of activities on Aug. 25 drew people with a variety of interests, Parenzen related. 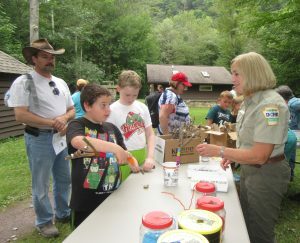 As many as 60 anglers participated in a fly fishing event in the morning, scores of families took part in workshops and children’s activities held in the afternoon, and approximately 150 people attended an evening performance by the Jam Crackers, where children who had made instruments from natural objects earlier in the day were invited onstage to join the band. MSRA will return to Worlds End State Park on Saturday, Sept. 8 for a limited participation snorkeling class led by Keith Williams, an avid underwater photographer. Those interested must call Parenzen at 570-768-6300 to reserve a spot. 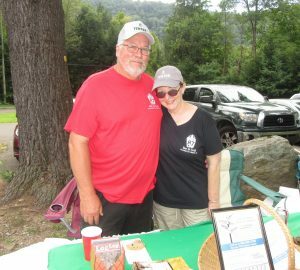 Williams, author of “Snorklehead – Adventures in Creek Snorkeling,” will help MSRA conclude their River of the Year celebration in November with a “Year in the Life of the Loyalsock” event that will feature his photos. A season of wild weather has kept Parenzen, MSRA board members and their many volunteers and partner organizations on their toes. A paddling event slated for June 23 had to be moved to a nearby lake due to low water levels. Conversely, in the months that followed, access to the creek was limited by high water and flooding. DCNR environmental education specialist Jane Swift (right) helps Pack 14 St. John’s Newberry scouts (from right) Isaac Stainbrook and Jimmy Baker make musical instruments from natural items as scout leader and Isaac’s father Mike Stainbrook looks on. Lucas Arbogast and mom, Britley of Williamsport take an interest in a display of birds common to the West Branch Susquehanna River watershed brought to Worlds End State Park by the Lycoming Audubon Society. Representatives Joan Sattler and Gary Metzger (not pictured) said that the children were most intrigued by the first glimpses through binoculars. 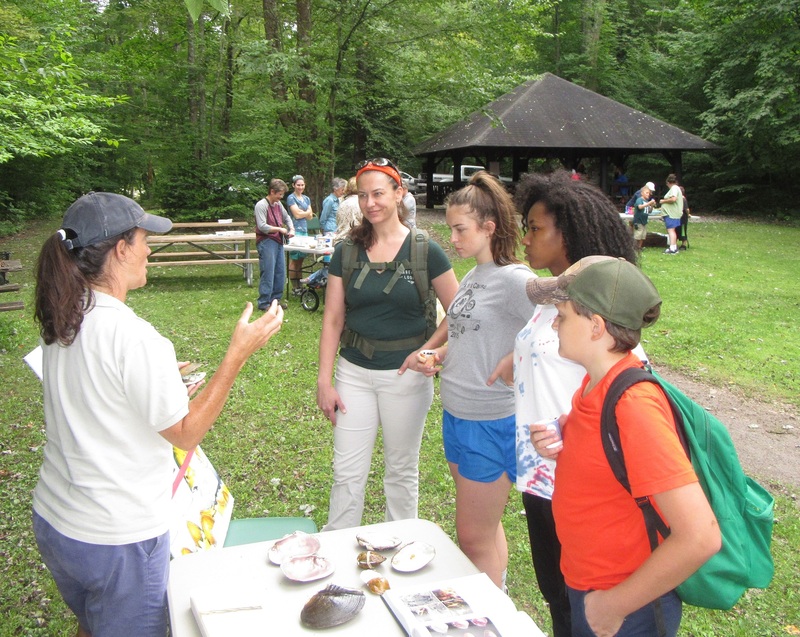 Elizabeth Capaldi of Bucknell University (left) extols the virtues of freshwater mussels in the Loyalsock Creek to (continuing from left) Marianne and Lily Wimer, Khalia Short and Brent Beane, who had also just planted sunflower seeds at the Sullivan County Conservation District table. 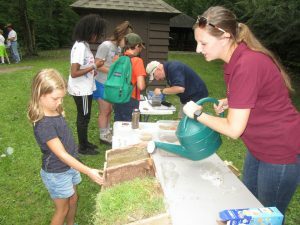 Sullivan County Conservation District Tori Welliver of Ulster shows Rowan Goldsmith of Liberty how creek water passing through sand, exposed soil, and turf produces different kinds of runoff and sediment. Rowan found out about Saturday’s “Loyal to the Sock” event when Carol Perenzen of the Middle Susquehanna Riverkeepers Association (not pictured) visited her grade school in Newberry. 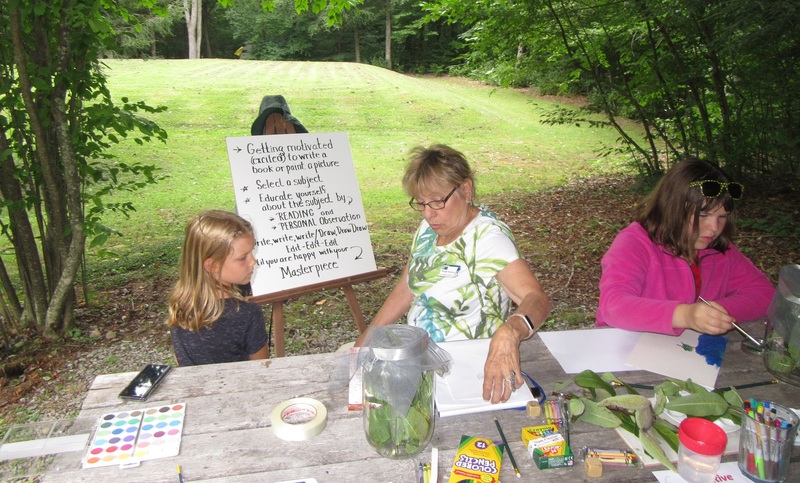 Wanda Plowman (center) encouraged youths to use a variety of art forms, including paint and poetry to express what they enjoy most about nature at Saturday’s event at Worlds End State Park. 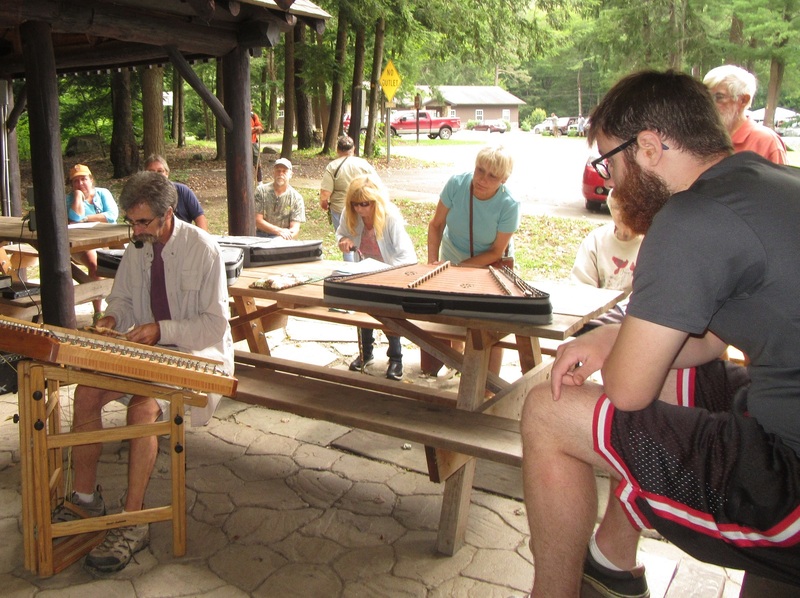 Dan Duggan, a member of the band Jam Crackers, who performed to a receptive crowd Saturday evening, mesmerized listeners in the afternoon as he hammered out some 19th century folk tunes on the dulcimer. 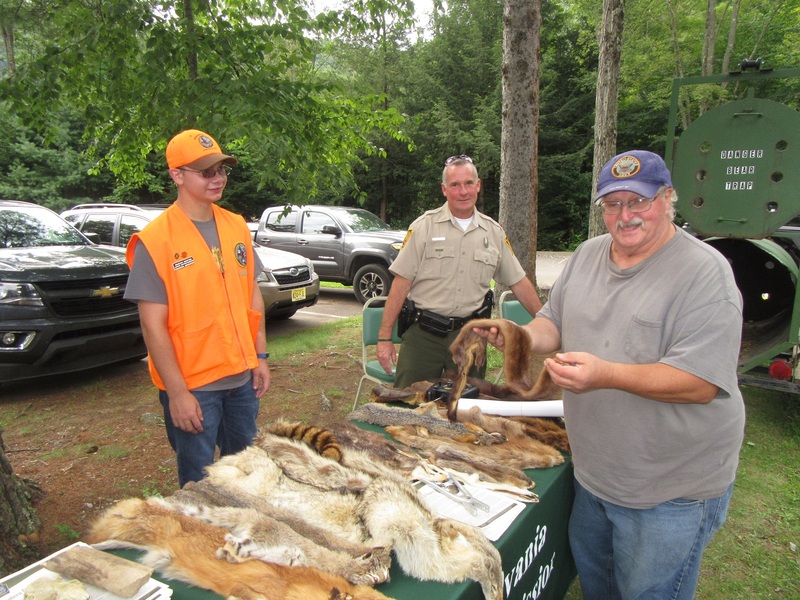 Howard Rooker of Forksville (right) admires a mink pelt in an exhibit sponsored by the Pennsylvania Game Commission and set up by trapper education volunteer Braedon Bedford and deputy game warden Michael Scott. 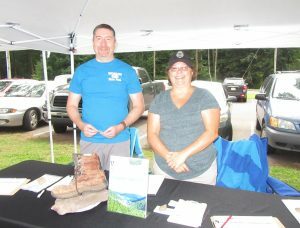 Friends of Worlds End State Park board members Dan Mumford (left) and Michelene Scott helped guide Loyal to the Sock guests to various activities and solicited ongoing support for the park. 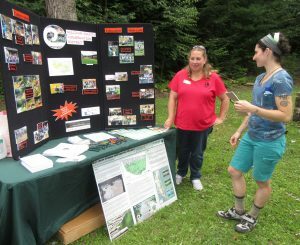 Though the Loyalsock Creek has been spotlighted this year as Pennsylvania’s River of the Year, Friends members would like to continue Loyal to the Sock as an annual event. Tom and Barb Yarnell of Forksville represented the Loyalsock Creek watershed association and other partner organizations at Worlds End State Park on Saturday.